After living in rental homes and apartments for nine years, one of the things I wanted to do first when we purchased our home was to plant a flower garden. For four years now, my kids and I have enjoyed (for the most part) the work of preparing the soil, planting the seeds, watering them, pulling the weeds, and watching flowers grow. We see God’s miracle in each flower. 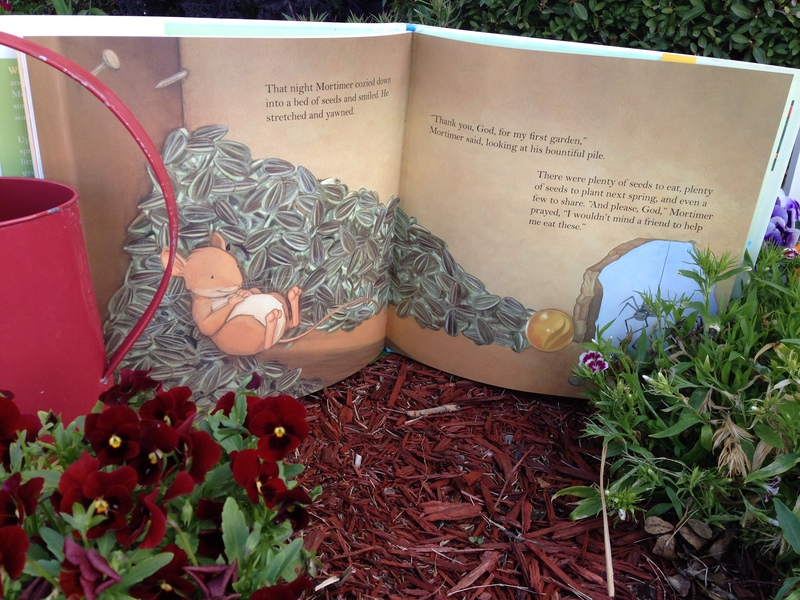 Our children and I can relate to Mortimer and the discoveries he makes while gardening. Like most of us, Mortimer does not like waiting. He had a couple of sunflower seeds in hand and his hungry tummy was telling him to eat them. But, when he overheard “big people” saying that one seed turns into many when you plant it, he was curious. Although doubtful, when he heard that it also makes everything around him green, that settled his hesitation. Out he went to look for a place to plant the seed and wait for green to appear in the midst of the brown world around him. 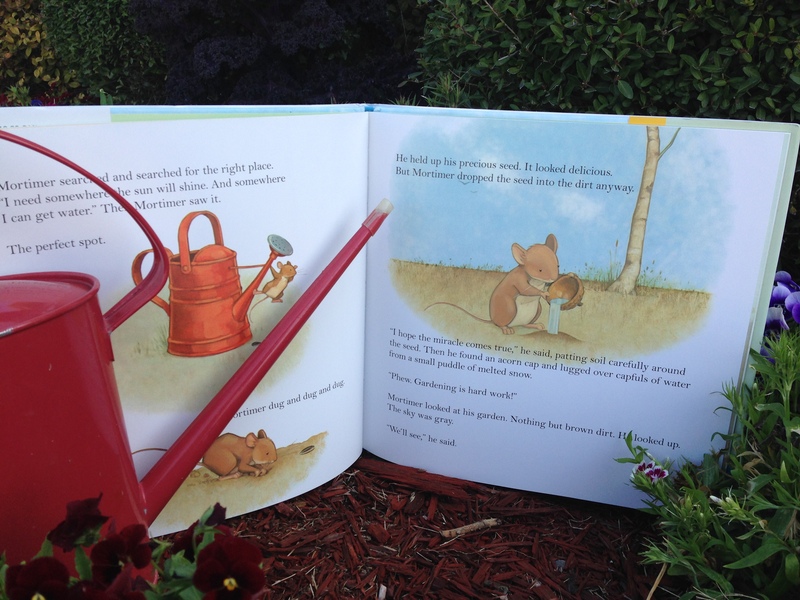 Hoping the miracle would come true, Mortimer worked hard all day searching, digging, planting and watering. The next morning, he was upset when he woke up to rain instead of green, and he considered digging up his seed to eat it right away. Instead, he looked up, said a prayer, and had a feeling in his heart that he should “wait”. See the illustrations below to see what friend appears to help. Below is a FRIENDS list of questions and activities for you to use with your audience. F– When have you felt like giving up while waiting for something you really wanted. 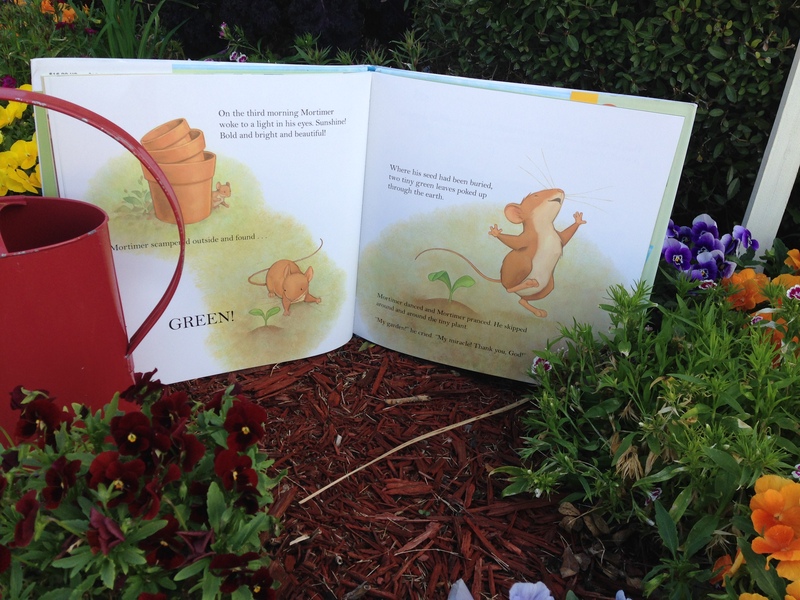 R- Can you relate to Mortimer’s excitement when he discovered the green plant and then the yellow sunflower? When have you been excited to receive something for which you’ve asked and waited? I– Imagine you could plant any flower, fruit or vegetable seed in your back yard and it would begin to grow in three days like Mortimer’s sunflower seed. What would you plant? E- Explore some local flower shops and select a flower to buy, plant, water and watch grow. Ask the gardeners there how much sunlight and water the plant needs so you can properly care for it. 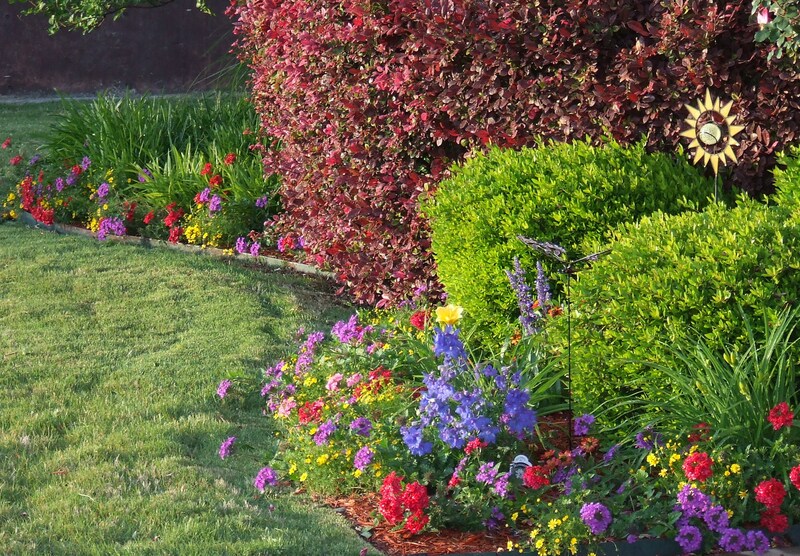 N- Navigate the best place in your yard to plant flowers or your home to put a flower pot so that it gets the right amount of sunlight. D- Develop an art picture by selecting your favorite illustration and sketching it. Then color or paint it and write on the picture the miracle you are asking God to bring forth in your life. Frame the picture as a reminder to wait for the miracle and see how He chooses to answer your request. 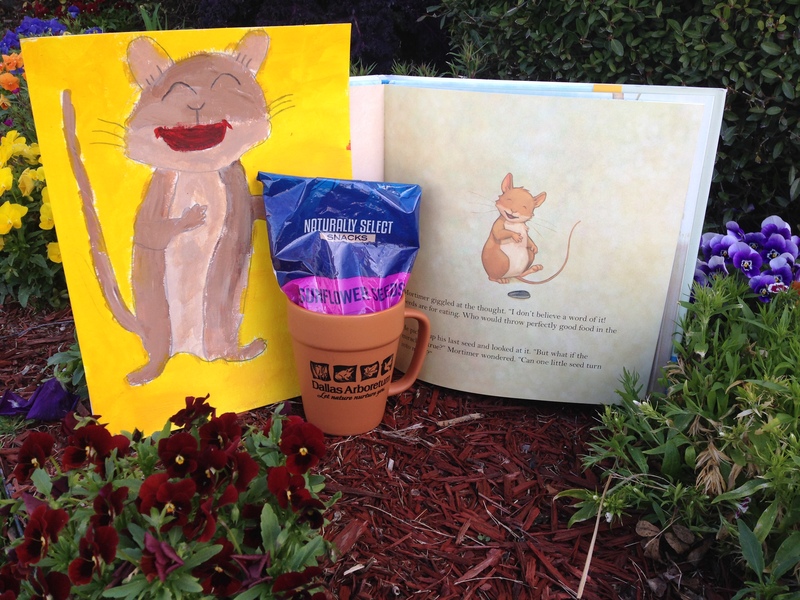 S- Share some sunflower seeds to much on while reading this fun book with your friends. When I first began gardening, I prayed that someone would help me get started as I had almost zero knowledge of gardening. My “miracle” began when I went to Covington’s and received incredible help on which plants to buy, how to prepare the soil for them, and how to tend the garden over seasons. Their help was the beginning of the many miracles that our family enjoys each year as we play around our flower garden. Thank you Covington’s Nursery for helping me select the flowers to plant in our garden! Beth urges us not “to eat the seed, but to plant it so it will yield a harvest”. See what she means by this statement. 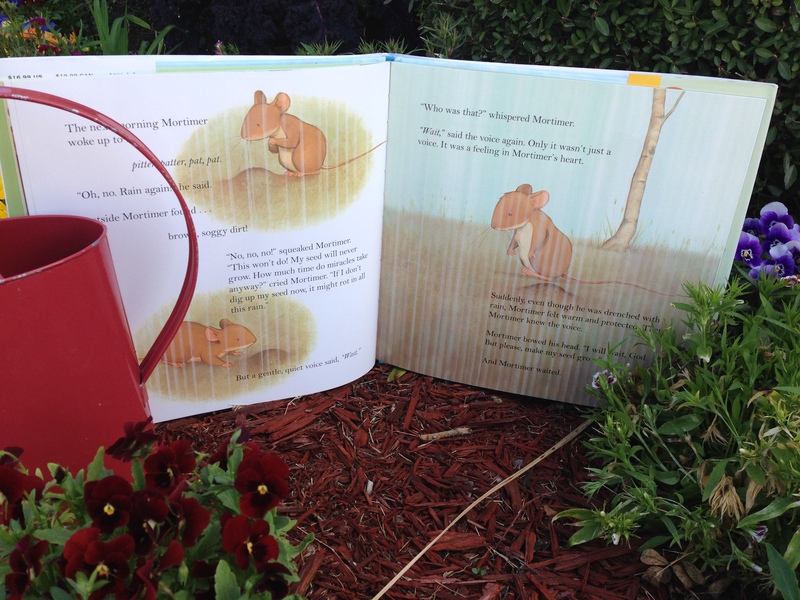 Her illustrations in the Law of The Harvest beautifully fit the illustrations in our Featured Friend. Expect a miracle! 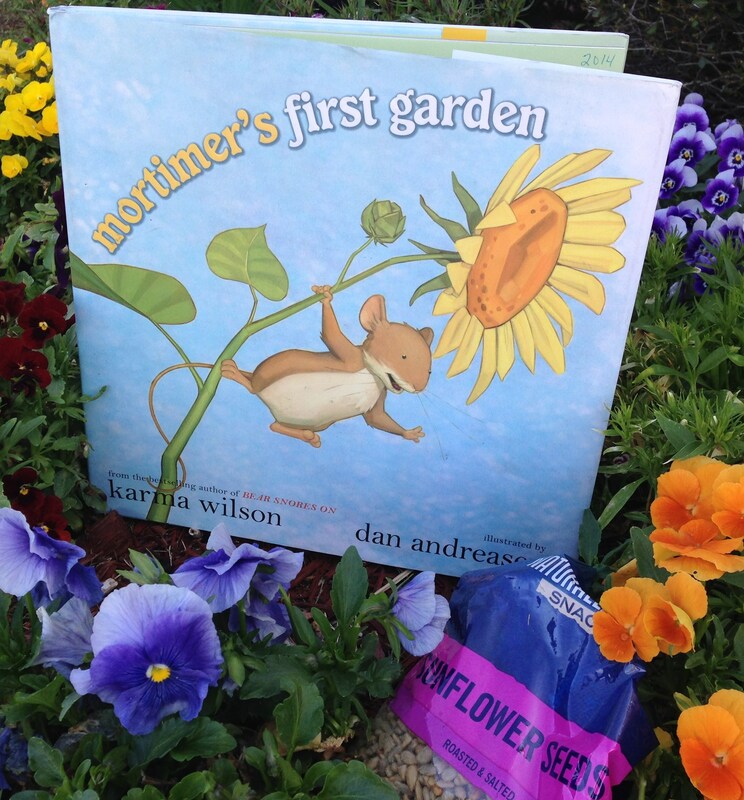 This entry was posted in garden, spring and tagged Beth Moore, Covington's Nursery, Dan Andreasen, garden, Karma Wilson, miracle, Mortimer, mouse, sunflower, sunflower seeds. Bookmark the permalink.